Mikail Ã (2014) Identification and Investigation of Phenotypic and Genotypic Characteristics of FlavobacterÄ±um PsychrophÄ±lum Ä±n Fry RaÄ±nbow Trouts (Oncorhynchus MykÄ±ss) in Some Trout. International Journal of Sciences 3: 24-34. Lahnsteiner F (2016) Effect of iodophor disinfection of nonâhardened Salmo trutta eggs on their bacterial and fungus load. Aquaculture Research. Santos CM. Ritmos de postura do sargo (Diplodus sargus) e da safia (Diplodus vulgaris). Identificação da microflora associada aos ovos (Doctoral dissertation). Küçükgülmez A, Eslem Kadak A, Celik M (2010) Fatty acid composition and sensory properties of Wels catfish (Silurus glanis) hot smoked with different sawdust materials. International journal of food science & technology 45: 2645-2649. Topkara ET, UstaoÄlu MR (2011) Investigations on the Aquatic Coleoptera (Classis: Insecta) Fauna of Some Mountain Lakes in the Eastern Black Sea Range (Turkey). 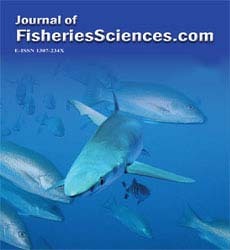 Ege Journal of Fisheries and Aquatic Science 28: 99-103. YalÄ±m FB, ÇÄ±plak B (2008) YeÅil Göl’ün (Antalya, Türkiye) Cladocera ve Copepoda (Crustacea) FaunasÄ± ile Populasyon YoÄunluÄundaki Mevsimsel DeÄiÅimler. EÜ Su Ürünleri Dergisi 25: 239-243. OLGUNOÄLU Ä°A (2011) Determination of the fundamental nutritional components in fresh and hot smoked spiny eel (Mastacembelus mastacembelus, Bank and Solander, 1794). Scientific Research and Essays 6: 6448-6453. Topkara ET, UstaoÄlu MR (2011) DoÄu Karadeniz daÄ silsilesindeki bazÄ± daÄ göllerinin sucul Coleoptera (Classis: Insecta) faunasÄ± üzerine araÅtÄ±rmalar. Ege Journal of Fisheries and Aquatic Sciences 28. YalÄ±m FB, ÇÄ±plak B (2008) Cladocera and copepoda fauna of Yesil Lake (Antalya, Turkey) and seasonal changes in population abundance. Ege Journal of Fisheries and Aquatic Sciences 25. Gunlu A, Gunlu N (2014) Taste activity value, free amino acid content and proximate composition of Mountain trout (Salmo trutta macrostigma Dumeril, 1858) muscles. Iranian Journal of Fisheries Sciences 13: 58-72. YÄ±ldÄ±z S, UstaoÄlu MR (2016) Denizli’deki daÄ göllerinin Oligochaeta (Annelida) faunasÄ± üzerine gözlemler Observations on the Oligochaeta (Annelida) fauna of the mountain lakes in Denizli (Turkey). Scope of the Journal 35: 89. Salma EO, Hechmi MI (2012) Hot Smoking Process on European Eels Fillets Composition and Its Impact on Oil Oxidation during Frozen Storage. Biomirror 3. Gokcek K (2011) Ð Un pia, Oreochromis niloticus (Linnaeus, 1758) and Himri Barbel, Carasobarbus luteus (Heckel, 1843), Duoculture in Net Cages. Journal of Animal and Veterinary Advances 10: 1102-1105. Sumer C, Teksam I, Karatas H, Beyhan T, Aydin CM (2013) Growth and reproduction biology of the blue crab, Callinectes sapidus Rathbun, 1896, in the Beymelek Lagoon (southwestern coast of Turkey). Turkish Journal of Fisheries and Aquatic Sciences 13. AydÄ±n M, KaradurmuÅ U, Erbay M. Length-weight relationships and reproduction characteristics of Liocarcinus navigator (Herbst, 1794) Liocarcinus navigator (Herbst, 1794) yengecine ait boy aÄÄ±rlÄ±k iliÅkisi ve üreme özellikleri. Pompei L, Franchi E, Giannetto D, Lorenzoni M (2012) Growth and reproductive properties of tench, Tinca tinca Linnaeus, 1758 in Trasimeno Lake (Umbria, Italy). Knowledge and Management of Aquatic Ecosystems 406: 1-3. ÇETÄ°NKAYA F, BEKLEYEN A (2016) Spatial and temporal distribution of aquatic insects in the Dicle (Tigris) River Basin, Turkey, with new records. Turkish Journal of Zoology 40. YÄ±ldÄ±rÄ±m Å, Suzer C, Çoban D, KamacÄ± HO, FÄ±rat K (2013) Effects of Illumination Intensity on Growth Parameters and Swim Bladder Development in Common dentex (Dentex dentex, L.) Larvae. Turkish Journal of Fisheries and Aquatic Sciences 13. Ikica Z, VukoviÄ V, ÄuroviÄ M, JoksimoviÄ A, Šifner SK, et al. (2014) Analysis of beak morphometry of the horned octopus Eledone cirrhosa, Lamarck 1798 (Cephalopoda: Octopoda), in the south–eastern Adriatic Sea. Acta Adriatica 55: 43-56. Ikica Z, Krstulovic Sifner S, Joksimovic A, Markovic O, Pesic A, et al. (Distribution of Musky Octopus (Eledone Moschata Lamarck, 1798)(Cephalopoda: Octopoda) in the South-Eastern Adriatic.